David was born in 1931. He was raised in New York City, mostly in Rego Park, Queens. “It wasn’t until years later that I found out I was born in New Jersey—another opposite. I was surprised that no one told me.” With three older sisters, he was considered the baby of the family. His father was a small business man. As a child, he remembers wanting to play the violin, but found himself in a clarinet class in elementary school. Actually, he says he knew so little about music at the time that he had confused “clarinet” with “cornet” and was just too shy to protest when he found that it wasn’t a brass instrument, so he just went along with it for three years. “No one in my immediate family was a musician, although my father’s side of the family were talented amateur artists and my mother had a strikingly beautiful untrained voice.” A cousin, Roger Sprung, is a well-known blue-grass banjo player; another cousin, Barbara Sprung Wilkes is a talented pianist and a nephew, Alan Menken, is the famous Oscar-winning Disney composer of films such as Pocohontas, Beauty and the Beast, Aladdin and The Hunchback of Notre Dame. David attended Stuyvesant High School, which is well known as a school that specialized in science education. David had always loved science and had thought that would be his career path. But he progressed very rapidly on the horn, quickly joining the high school orchestra. After six months of lessons, he got into the All-City High School Orchestra and was playing in numerous community orchestras. He joined Local 802 in 1946 at age 15. In his senior year, he applied to the University of Michigan as a bio-chemistry major, but was turned down. When his high school music teachers suggested to the University that they were losing a great horn player, they took a second look. “But by that time I had decided to go to Queens College, which was tuition-free and an excellent liberal arts school.” He lived at home and immersed himself in his studies. On tour with the Metropolitan Opera, 1960. Princeton had promised David that they would get him a placement after graduation, but teaching jobs were tight at the time, so he returned to New York and taught part time at Queens College and City College. He also free-lanced as a horn player, finding work in The Orchestra of America, and the Symphony of the Air (previously the NBC Symphony) and a few other engagements. At the end of that year he auditioned and got into the Royal Ballet Orchestra as principal horn, which was traveling for twenty weeks in the US. He also took an audition for the New York Metropolitan Opera Orchestra, and won. “In those days, they did not advertise in the International Musician; it was all word of mouth. But as a freelancer I found out about it.” He was able to find a sub to get out of his touring contract, and began playing for the Met as a 2nd and/or 3rd horn in 1960. He returned to his plan of getting a college teaching job. With the help of a music teacher placement service, he found a job as Assistant Professor of Horn and Theory at the University of Wichita, in Kansas. He taught horn and music theory, but was soon dissatisfied there because, while he enjoyed teaching, the general academic environment was not what he expected nor was accustomed to. After three years, he called Princeton again, and they told him there were opportunities in California, which was expanding its university system at the time. He took a post at Sonoma State College, a brand new school that was starting a music department. “Fred Warren was the chairman. He was less impressed by the fact that I graduated with honors from Queens, and got a Fellowship at Princeton, but for some reason he really liked the idea that I had gone to Stuyvesant High School.” It was 1966. He moved to Novato with his second wife, Gail, and began teaching theory and composition and tried to organize a community orchestra at Sonoma State. “That was difficult because the Santa Rosa Symphony, then itself a community orchestra, seemed to feel threatened as I saw it, although I did end up playing with them from time to time.” He also began subbing with the San Francisco Opera Orchestra and the San Francisco and Oakland Symphonies, but found that the school was somewhat skeptical of his outside activities due to some scheduling conflicts. Brian McCarty, Keith Green and David Sprung. Sometime during the ‘80s, David decided to ask for partial leave from teaching so he could concentrate more on performing. He taught half-time and continued to play in the Opera and Ballet Orchestras, and on freelance gigs, including recording sessions at Skywalker Ranch. His nephew, Alan Menken, invited him to play some of his film dates in Los Angeles. After two years, he began commuting coast-to-coast, coming back for the opera season and returning to Florida the rest of the year. 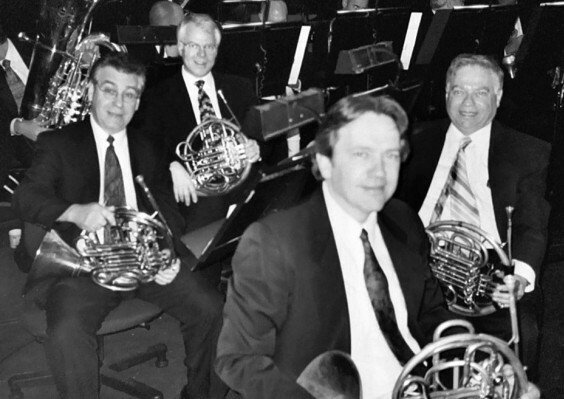 In 2004, the Sprungs returned to the Bay Area permanently and David retired from the Opera Orchestra in 2008. Today, he continues to compose and freelance. He has played principal horn with the Midsummer Mozart Festival since 2005. Last week, he played with the Symphony Silicon Valley. In retirement, he has resurrected pieces he composed while at Princeton and Queens College and is working on new material, including solo piano pieces, a horn quartet, and a choral work. “Eventually, I hope to work on larger pieces for orchestra, and who knows, maybe even an opera.” He recently had compositions performed by the Symphony Parnassus and the San Francisco Composers Chamber Orchestra.